Oops! In a happy accident, Comet Lovejoy just happened to be in the field of view of the 570-megapixel Dark Energy Camera, the world’s most powerful digital camera. One member of the observing team said it was a “shock” to see Comet Lovejoy pop up on the display in the control room. “It reminds us that before we can look out beyond our Galaxy to the far reaches of the Universe, we need to watch out for celestial objects that are much closer to home!” wrote the team on the Dark Energy Detectives blog. 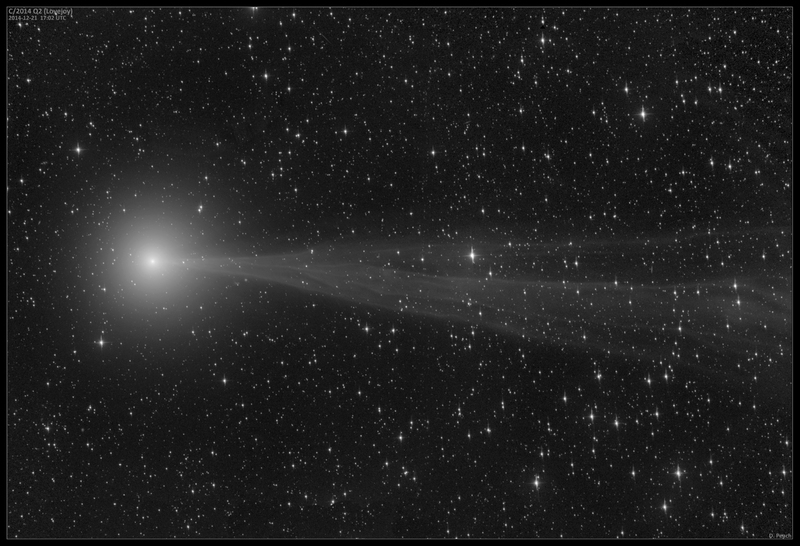 On December 27, 2014, while the Dark Energy Survey was scanning the southern sky, C2014 Q2 entered the camera’s view. Each of the rectangular shapes above represents one of the 62 individual fields of the camera. At the time this image was taken, the comet was passing about 82 million km (51 million miles) from Earth. That’s a short distance for the Dark Energy Camera, which is sensitive to light up to 8 billion light years away. The comet’s center is likely made of rock and ice and is roughly 5 km (3 miles) across. The visible coma of the comet is a cloud of gas and dust about 640,000 km (400,000 miles) in diameter. The Dark Energy Survey (DES) is designed to probe the origin of the accelerating universe and help uncover the nature of dark energy by measuring the 14-billion-year history of cosmic expansion with high precision. The camera just finished up the third, six-month-long season of observations, and the camera won’t be observing again until this fall. You can download higher resolution versions of this image here.